Filterlogic FL-RF07-3 - Provides 6 months or 300 gallons of refreshing water for the average household. Please note this is a compatible spare part and the manufacturers' names and part numbers have been used for reference purposes only. Replacement for maytag ukf8001, ukf8001axxp, 67003526, 67006637, 67003528, owf50-ni300, 12589208, filter 4, 469006, ukf8001axx, ukf8001-750, ukf8001p, 12589201, wf50-kwi500, puriclean ii, 67003523, wf50-wi500, wf50-kni300, wrx735sdbm, 67003727, 67002671, 67003591, ukf8001axx-750, wf50-ni300, wf50-ni500, 67003523, 4396395, 67003527, 12589210; owf51, 67006474, wrx735sdhz, ukf8001axx-200, wf-ukf8001, 12589206, 67002269, 12589203, 46-9006, owf50-wi500, GI6FDRXXY07. 100% satisfaction guarantee with the top-quality product, prompt service and timely delivery. Certified to nsf 42 to significantly improve water quality by reducing chlorine, taste and odor. This filter is not the original product. Save big without compromising quality. Retains beneficial minerals to produce healthy drinking water. 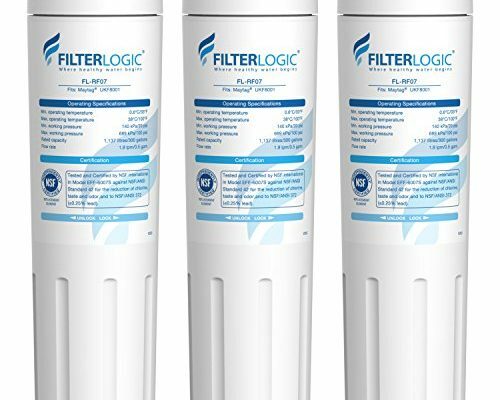 FilterLogic Refrigerator Water Filter, Replacement for Maytag UKF8001, PUR, Jenn-Air, Filter 4, 4396395, UKF8001AXX, UKF8001AXX-200, UKF8001AXX-750, 469006, Pack of 3 - 100% satisfaction guarantee FilterLogic offers unconditional 30-day money back guarantee. 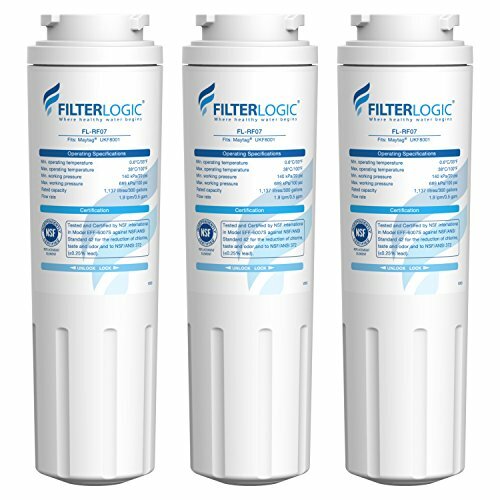 Filterlogic fl-rf07 replacement refrigerator water filter where Healthy Water Begins NSF 42 Certified Performance Certified to NSF 42 for the reduction of Chlorine, Taste and Odor. This filter is not the original product. Replacement for kitchenaid: 8171032, golden icepure rwf0900a, onepurify rfc0900a, more pure filters mpf15090, swift green sgf-m9, tier1 rwf1040, 8171249, kbfs25etss01, mist cwmf004, icepure, clear choice CLCH101, HDX FMM-2, pure line pl-400, aqua fresh wf295, EcoBlueLife EBL7770, crystala filters cf5, SGF-M10. Filterlogic FL-RF13-3 - Please note this is a compatible spare part and the manufacturers' names and part numbers have been used for reference purposes only. Works exactly like the original filter without water leaks. Provides 6 months or 300 gallons of refreshing water for the average household. Certified to nsf 372 for lead-free material, giving you the basic protection. Accurate design makes the replacement a breeze. This filter is not the original product. Save big without compromising quality. Retains beneficial minerals to produce healthy drinking water. Replacement for smartwater, pure line pl-100, tier1 rwf1060, crystala filters cf8, 469996, 469991, hdx fmg-1, golden icepure rwf0600a, best bf-g01, 46-9991, mist cwmf031, gwf01, 46 9996, onepurify rfc2500a, rwf1060, pc75009, pureza pf8, icepure, 197D6321P006, kenmore 9991, mwfp, waterfall filter wfc1201, GE MWF, wfc1201, gse25gshecss, mwfa, 9996, gwf06, gwf, 46-9996, gwfa, 46 9991, ecobluelife ebl7771, WaterSentinel WSG-1. FilterLogic Refrigerator Water Filter, Replacement for GE MWF, SmartWater, MWFP, MWFA, GWF, HDX FMG-1, WFC1201, GSE25GSHECSS, PC75009, RWF1060, 197D6321P006, Pack of 3 - Certified to nsf 42 to significantly improve water quality by reducing chlorine, taste and odor. 100% satisfaction guarantee with the top-quality product, prompt service and timely delivery. 100% satisfaction guarantee FilterLogic offers unconditional 30-day money back guarantee. Our professional customer service team will take care of your problem in a timely manner. Lead-free materialcertified to NSF 372 for lead-free compliance. YUNDA RWF0900A-2PACK - Please note this is a compatible spare part and the manufacturers' names and part numbers have been used for reference purposes only. Icepure ukf8001 replacement models amana/maytag----ukf8001 ukf8001axx, ukf9001, 67003527, ukf8001axxp, 12589208, 67003523, ukf8001p, ukf8001axx-200, ukf8001axx-750, abl2233fes, ukf8001, 67003591, 12589201, 12589203, 12589206, 67002269, 67003528, 67003526, 67003727, ukf9001axx, 67006637, 67006474, 67002671, 12589210. High quality icepure ukf8001 refrigerator water filter is made of high quality natural coconut shell activated carbon-safety and health. 100% 90-days manufacture warranty we are sure you'll enjoy the benefits of our product! We offer 90-day money back guarantee and a friendly customer service. Retains beneficial minerals to produce healthy drinking water. ICEPURE UKF8001 Replacement Refrigerator Water Filter, Compatible with Maytag UKF8001, UKF8001AXX, UKF8001P, Whirlpool 4396395, 469006, EDR4RXD1, EveryDrop Filter 4, Puriclean II, RWF0900A 2PACK - 100% satisfaction guarantee with the top-quality product, prompt service and timely delivery. Kenmore/sears------46-9005, 9005, 9006p, 469005, 04609005000, 9005p, 46-9006-750, 469006-750, 9992p, 46-9006, 469005-750, 469005750, 9992, 9006, 46-9992, 469006750, 46-9005-750, 469992, 469006, 04609006000. Whirlpool/everydrop-----filter 4, 4902821, wf50-ni300, owf51, wf50-kni300, wf51, owf50-wi500, wf50-wi500, wf50-ni500, 480181700573, owf50, edr4rxd1, owf50-ni300, wf50, gi6fdrxxy07, wf50-kwi500, Puriclean II. For detailed setup guideline, please refer to the installation instruction in the box. Easy installation and Operation No tools required. Important】★please kindly note this is a compatible spare part and the manufacturers' names and part numbers have been used for reference purposes only. Whirlpool W10501250 - Simply place one tablet in the wash basket without clothes and run a Normal Cycle hot option or Clean Washer Cycle. Accurate design makes the replacement a breeze. While bleach only kills odor-causing bacteria leaving behind the detergent residue, Affresh Washer Cleaner uses surfactant chemistry to remove the root problem. Certified to nsf 42 to significantly improve water quality by reducing chlorine, taste and odor. Please note this is a compatible spare part and the manufacturers' names and part numbers have been used for reference purposes only. Same great quality at a fraction of the price without water leakage and high flow rate. Affresh Washer Machine Cleaner, 6-Tablets, 8.4 oz - Replace filter every 6 months or 300 gallons, which come first. 100% money back guaranteed we are sure you'll enjoy the benefits of our product! We offer 90-day money back guarantee and a professional customer service. Compatible modelmaytag ukf8001 ukf8001axx ufk8001axx-200 ufk8001axx-750 ukf8001p ukf8001axxp;kenmore 46-9005, 9006p, 9006, 8171032, edr4rxd1. The manufacturer's names, kbfs25etss01;whirlpooleverydropowf51, wf50-wi500, 469005-750, 469005, 9005p, 469006750, 8171249, 46-9006-750; kitchenaid 4396395, 9005, wf50-ni500, gi6fdrxxy07, 46-9005-750, 469006, filter 4, 46-9006, 469006-750, Part Numbers Have Been Used For Compatibility Information ONLY. Septic tank safe. Note: the date on the item is production date not expiry date. Affresh cleaner is a formulated, foaming tablet that gets under residue, slow-dissolve, breaks it up and washes it away leaving the washer smelling fresh and clean. Septic tank safe. Note: the date on the item is production date not expiry date. Filtrete clean living filters are electro-statically charged to help capture more particles from your air. Certified nsf42 by nsf and wqa icepure brand refrigerator water filter are tested and certified by NSF And WQA for chlorine, bad taste and odor reduction. Efficient filtration use high grade natural coconut shell activated carbon that remove sediment, color, Chlorine, Odor, Voc, particles, rust, THM'S. Easy installation no tools required. Same great quality at a fraction of the price without water leakage and high flow rate. Replace filter every 6 months or 300 gallons, which come first. Filtrete Clean Living Basic Dust Filter, MPR 300, 20 x 25 x 1-Inches, 6-Pack - 100% money back guaranteed we are sure you'll enjoy the benefits of our product! We offer 90-day money back guarantee and a professional customer service. Compatible modelmaytag ukf8001 ukf8001axx ufk8001axx-200 ufk8001axx-750 ukf8001p ukf8001axxp;kenmore 46-9005, 9006, 8171032, 9006p, edr4rxd1. The manufacturer's names, 46-9005-750, 469006750, gi6fdrxxy07, wf50-ni500, 469006, kbfs25etss01;whirlpooleverydropowf51, 46-9006, 469006-750, 9005p, 9005, 469005-750, 8171249, 469005, wf50-wi500, filter 4, 46-9006-750; kitchenaid 4396395, Part Numbers Have Been Used For Compatibility Information ONLY. Aprilaire 35 02 - The humidified air is carried through the house through the air ducts. By aprilaire - the leader in indoor air quality solutions, 360, 560, 700, 600, 568, 700A, to optimize the performance of your Aprilaire Humidifier Model: 350, 600A, 760, 768. Perfect aprilaire fit water panel dimensions: 10" H x 13" W x 1. 75" w. Works exactly like the original filter without water leaks. Septic tank safe. Note: the date on the item is production date not expiry date. Filtrete clean living filters are electro-statically charged to help capture more particles from your air. Lasts up to 3 months. Designed with filtrete brand 3-in-1 technology from 3M to pull in and trap unwanted air particles while letting clean air flow through. Aprilaire 35 Replacement Water Panel for Aprilaire Whole House Humidifier Models 350, 360, 560, 568, 600, 600A, 600M, 700, 700A, 700M, 760, 768 Pack of 2 - Provides 6 months or 300 gallons of refreshing water for the average household. Water is vaporized as air warmed by the furnace passes over the water panel. This filter is not the original product. Save big without compromising quality. Specially formulated tablet dissolves slowly, lasting throughout the entire wash cycle and breaking up residue better than bleach. Ideal-Air 736458 Duct Collar Air Tight, 6"